Beloved Spear: Resistance is Futile. Hawking Will Be Assimilated. Resistance is Futile. 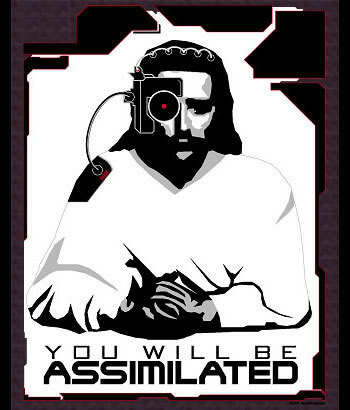 Hawking Will Be Assimilated. The concept of the multiverse has been resisted by nearly every corner of Christianity. Catholicism has renounced it, although not at the level of the Papal See. The Young Earth Creationists over at Answers in Genesis haven't said much about it, other than to scratch their heads, mumble confusedly about them newfangled theories, and go back to building their new animatronic diorama of Jesus riding a velociraptor into Jerusalem. Some gracious and highly intelligent Christians who have embraced a scientific worldview do struggle with the concept, because it seems to subvert the things about this spacetime that they see as evidence of God's design. I'm thinking, in this case, of folks like NIH Human Genome project director Francis Collins, who sees God's work in the marvelous and intricately interwoven dynamics of our spacetime. He's not wrong, of course. I see God at work in creation too, and for many of the same reasons. But I think, ultimately, that clinging to the idea of a single linear spacetime will prove as pointless as assuming that the earth is flat, or that it is at the center of the universe. There are some concepts we can let go without doing damage to our faith. I think when folks like Collins assume that a multiverse is antithetical to Christian faith, they are responding that way for two reasons. First, because the atheistic scientific proponents of the multiverse present it as by necessity atheistic, and second, because we haven't from the standpoint of faith fully explored the theological ramifications of a multiverse cosmology. It is that first assertion that needs some non-reflexive testing against the core assertions of Christian faith. Is a multiverse axiomatically atheistic? One of the strengths of Christianity as a living faith is that it can incorporate into itself anything it encounters, so long as that thing is not antithetical to the purpose of the Biblical narrative, our view of our Creator, and the essence of what Jesus taught. Some things, like totally stealing the practice of having an evergreen indoors, are trivial. Other things, like the use of Aristotle's concept of substance by Tertullian and the Cappadocian Fathers to philosophically frame the relationship between Jesus and God and Spirit, well...that's a bit less trivial. For reasons I've explored frequently in my blogging over the last five years, I hold that the insights of quantum physics and M-theory are entirely compatible with both theism generally and Christianity in particular. Hawking and Mlodinow do not see it that way, and perhaps it's a bit cruel to take their candy. So let's sample it. Give it a lick. See how it tastes. The first question that has to be asked about M-Theory is this: does it obviate the need for a God, or disprove God's existence?